Spring is here which means it’s time to get your house in order for the festivities that come with better weather in the PNW. A good spring cleaning is usually a necessity after a winter of neglect and dirty weather conditions. Not only will it promote wellness and a healthy home but can motivate you to be better organized for the rest of the year. By taking the time to do a traditional deep cleaning in spring you’ll give yourself and your family that fresh-start feeling brought on by the new year which can last well into summer. 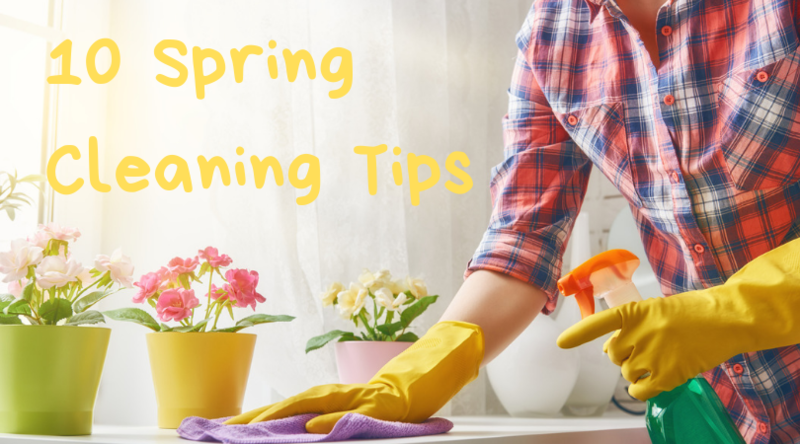 Clean Arrival LLC knows that you can clean most of the home yourself if you have the time, tools and cleaning products so we’ve compiled a list of 10 Spring Cleaning Tips to help you plan that big clean. If you don’t have the time, you can always contact us for convenient, professional and local cleaning services. If you want your sink and faucet to shine this year then take a lemon half and rub it all over the water stains. The citric acid helps make removing hard water much easier and without using harsh chemicals. You’d be surprised how many Green Cleaning solutions are available, you can read more about them here. Don’t discard those used lemon halves quite yet, use them on your microwave to make cleaning it super easy. You can also use new lemons if you like, just squeeze some juice into a half cup of water along with the rinds. Next, Microwave the mix for 3-5 minutes without opening the door. The trapped steam and citric acid will make wiping out all those crusty old food remnants a breeze. If you’re looking for a natural way to clean your shower head then consider using white vinegar. This natural and flexible product is actually a super powerful cleaning agent that can help dissolve the mineral deposits that build up on your showerheads. Just fill a plastic bag with white vinegar, secure it over the showerhead with a rubber band and leave it overnight. Next day you should be able to run your shower to blow out the dissolved deposits and improve the showerhead performance. For a natural heavy-duty cleaning alternative for your stainless steel sink, you should consider using baking soda. Just wet your sink with some water, sprinkle with baking soda, then scrub it with a sponge! To get flawless window wiping results simply mix ¼ cup of white vinegar, 2 cups of water and 2 teaspoons of liquid soap into a spray bottle. Spray the solution on the glass then wipe it down with a newspaper for streak-free windows or mirrors. Place a wet dryer sheet on your burnt stove top for 15 minutes or more to soak into the caked on food leftovers. After a while it becomes as easy as wiping off with a paper towel. If your grill is still covered with leftovers from last summer then heat it up and spray some white vinegar onto them. Next, scrub the area with an onion, seriously! We know it sounds wierd but the acid in the onion will easily remove any leftover food on the grates. If your TV or other delicate products and places in your home constantly have fingerprints on them but you’re afraid of using something too rough then you can use a coffee filter. The fibers in the filter are gentle and make wiping away fingerprints super simple. Use a rubber squeegee to easily clean up excess pet hair as the rubber can easily grips and removes fur from your home. Finish by running the vacuum to catch any hair still on the surface. For the best local spring cleaning solutions contact Clean Arrival LLC. To schedule a cleaning service visitour booking page or call us at 503-567-5404. You can also message us on Facebook or email us here.